Went out at 2:35-ish on the Boardman and did exactly the ride I'd planned, for once. Although the Twycross route is a bit of a Saturday tradition, it's nice to do something a bit different for a change. This particular ride involved a new stretch, between Melbourne and Wilson which is not a super-quiet road but does have a lovely view of the landscape for miles to the north. That particular part of the ride, just south of the race track was particularly enjoyable as I had a powerful tail wind. I didn't find the wind too bothersome overall. Only a very small part of the route involved cycling straight into it. But the bright sunshine promised by the BBC forecast never materialised, sadly. In fact things became a bit gloomy around 4pm. But it didn't rain and the roads were nice & dry all afternoon despite a bit of rain this morning. Noticed another expired mouse in the garage. Got to say these simple plastic traps really work well - nice clean kill every time. I think that's 18 now. Used my Garmin Foretrex to record the track - it's not the most convenient device to use for a shortish run like this but it had been so long since I last used it that I thought it deserved a run out. Nothing but flippin' rugby on 5 Live this afternoon so I listened to Gilles Peterson on 6 Music, and that was a nice change as well. Knees held up pretty well over 22.58 miles - quite pleased and quietly confident things are going the right way, albeit slowly. Maybe a 25-miler next weekend, weather permitting. Curiously the elevation recorded by the track as uploaded to Strava - 939ft - is significantly less than the Strava route planner claimed. That's 85 miles this month, 120 to target. Well, I suppose the wind had moderated since this morning, but the winds at what passes for altitude in these parts were still on the tempestuous side at times. I managed to do exactly as I planned which I thought I might have to curtail at some points, but I stuck to the roads - thankfully - and plodded my way uphill. Cycling westwards was jolly hard work into the wind, which was pretty constant and not overly gusty. The sun shone most of the time, with just a fleeting rain shower at one point, but the descent down to Froggatt was extremely wet, then the Padley climb from Grindleford just a couple of miles away was bone-dry. For whatever reason - and if I don't know, then you won't - I decided to ride uphill in a gear higher than normal, I managed it, but it knocked down my average cadence. The top of the Fiddler's Elbow climb was a tad breezy and I found myself being pushed over to the wrong side of the road at times. luckily it wasn't as busy as a couple of weeks ago so I didn't get splat! Going down Stony Ridge Road was quite "fun" with a strong cross-headwind from the right, so much scary fun that I went round and did it again! Good job I did, as I wouldn't have got up to 50 miles otherwise. Mrs S was certain I wouldn't get out on the bike today. The winds were far too gusty and too many squally snow showers were passing through. I however, trusted in the BBC forecast that whilst the winds would still be strong at 16:00 the 40+mph gusts would be gone and the snow showers would have melted away. Come four o'clock, the gusty winds had indeed abated and the sun shone from an almost cloudless sky, so off I went for a couple of hours. All went well for the first 90 minutes, apart from the nagging headwind. Then all of a sudden, just as I was contemplating taking a longer way home the sky turned black, the wind strengthened and small hailstones came horizontally straight into my face, coming over the top of my glasses and peppering my eyes. Discretion being the better part of valour, I stopped off in a bus shelter. The hail stopped. The snow started, within two minutes the roads were covered and the street lights kept flicking from off to on, uncertain as to what to do - like me. Great. After 10 minutes the snow turned to rain and whilst it was still blowy I set off into the slush - slowly. What had been a quite enjoyable ride was now rather hellish, especially as my cold hands couldn't change gear well. I've passed 900 miles for the year now. Dry day, though a bit cold and blowy. Keen to keep my knee joints working and the weather is decidedly iffy over the next week or so, so I made the best of a long-ish lunch break with a short version of the Twycross. I was quietly thrilled with the state of my knees on Saturday - not a sentence many people will get to type in their lifetime - but yesterday I may have overdone the physio exercises because the right one has been a bit sore all day. And it did hurt a bit throughout the ride, but it didn't get any worse. Hopefully it will wear off in a day or two. Was keen to try the new pedals so I took the X. Unfortunately while the right one was fine, the left one didn't work too well - it was impossible to clip into it. The hook at the front of the cleat was well enough anchored and I didn't have any difficulty riding, in fact I forgot about it after a while. But I had at least 90 degrees of circular movement pivoting from the front of the cleat; basically as much as my ankle would tolerate. Annoying. Might be that the left cleat is a bit worn out but all my other left pedals are happy enough with it as it is. Although the new pedals look mostly like my other PD-R540s they do have the text "LIGHT TOUCH" printed on them, so perhaps a slightly new / different design. Will be annoying if I have to start changing cleats early just because of one fussy pair of pedals. But perhaps it's an adjustment issue. I didn't have time to look closely. I was also annoyed by the sheer quantity of compacted clods of mud on the roads, presumably from farm vehicles. Anyway quite a pleasant run out, otherwise. 16.62, which takes me to 101 this month. Weather looks awful this weekend, here in the E Mids anyway. Bah. No rain tomorrow supposedly, but 43mph winds during the day. Chucked it down this morning, but only briefly and by afternoon the roads were mainly dry. By 3pm or so the gale force winds had abated a tad. Still very blowy, but the forecast over the next few days is pretty awful so I thought I'd take advantage of a brief dry spell. I did a Twycross. I briefly considered doing a long-ish version taking in Ratclffe, something I haven't done for months - but settled for a compromise and did the longer-than-of-late but shorter-than-Ratcliffe-variant Sibson version. Very nice to be gliding along the quiet road between Sheepy and Sibson, and it wasn't overly troubled by mud. Just managed to pass the farm north of Sheepy in advance of a huge herd of cows being guided over the road - I've had to wait for them before; a remarkable sight but rather time-consuming. And by Christ, that farm honks to high heaven. Mixed bag, weather-wise. Strong wind, but only really bothersome over a few miles. I did worry about being blown in front of a car passing me from behind on Ashby Road. A couple of brief, light showers. Some overcast gloom. And a bit of warm sunshine. My knees held up quite well - better than Monday, but not as well as Saturday. Who knows why? No rhyme or reason, really. I mean - I'm sure that on some level, my knees and my perception of them must be obeying the natural laws of our universe in some rigidly deterministic fashion. But I can't fathom them myself. 22.49. Just another 82 to do this month to stay on target. 124 done already in March. Last night I planned a ~26 mile route for today that would have taken me down to Twycross as usual, but through Shenton to Bosworth, then back through Bagworth. However, as I pulled my bike out of the garage this morning, I decided that it was too risky - I'm on call at the moment and the route I'd planned would take me too far from home. So as I set off, I decided to try to make up a route that would still see me doing ~26 miles but without travelling so far from home at the most distant point. So I thought I'd head north for a bit, come back down, then do a short Twycross to the south and back home. And that's what I did. 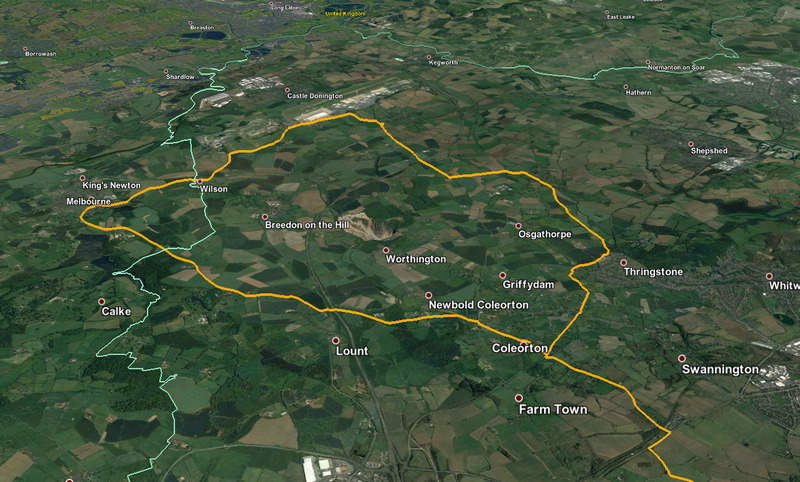 Up to Belton and the top of Top Brand, then back down through Peggs Green, Coleorton and Farmtown. I hadn't been through Farmtown for a very long time. It was actually part of my default route of 7 miles or so when I was a very occasional cyclist and I don't think I've ever been that way on a proper road bike. Was interested to see how I'd cope with the brief but steep hill there - better than I used to back in 2014 or so in fact. I was on a lighter bike today of course but I think my legs are stronger, if a few years older. Anyway from there I crossed Ashby road, came through Packington and past Measham then tacked a short Twycross onto the route. It was obvious by this time that I was going to end up doing more than 26 by going down to Twycross, but I couldn't really think of anything better. Looking at the map now I suppose I could have cut across to Shackerstone from Snarestone. But anyway I didn't, and ended up on 31.14 miles. The weather was forecast dry, but actually while I was putting my gloves on with the bike leaned against my car ready to go, a few hailstones clattered against the windscreen and bonnet. That soon stopped though, fortunately. Nonetheless, once again a mixed bag of weather with cold sharp rain, bright pleasant sunshine and gloomy overcast conditions in varying quantities. I can't say I enjoyed myself much during the rain and I hadn't quite wrapped up warm enough, but overall an enjoyable run out. Despite being pressed into service for a few more miles than I'd intended, my knees coped well. A bit sore now. Nothing unusual. But I'll keep the distances down to 25 or so for now (can't always get the time to do more than that anyway). No interesting wildlife of note. A couple of dead frogs (or toads, no idea). A dead fox, a dead badger. A juvenile cat carrying a squirrel it had (presumably) just killed at Farm Town. Not much older than a kitten really. It wasn't much bigger than the squirrel. After thinking the weather would be too bad for a ride yesterday, I overindulged in strong red wine on Friday night, but there was a clear enough slot to get an hour in just riding up and down the hill in a local park. The wind did start bringing me to a standstill as I turned round at the top of the hill, then the rain taps opened so I came in. Today seemed a much nicer proposition, sunny skies with just the odd hailstone or raindrop, but still plenty of wind. The roads were a bit mixed too, varying from bone dry, to running with rivers - almost literally going down to Stony Middleton - often switching several times in the space of 200 yards. I managed to tackle a hill I'd never done before, and I wish I hadn't. My Garmin was telling me that a long stretch was over 16%, Strava says no more than 15%, but Map my Ride has a section - 0.06 of a mile - not much but it felt like an age, which averages 20% It looked like a wall to me! It was all a bit too soon after the first bit of the Longstone Edge climb - 0.61 miles at 9% - but the views from the top were stunning. I'm blessed to live so close to the Peak District and cursed that it's so full of bloody hills! The only notable bit of wildlife today was a partridge. Which gets me to 194 miles for March and over 16,000 feet of elevation gain. Wanted to get some more miles into my legs - my physio advised me yesterday to man up, keep increasing my distances and ride often - so I left work early with the idea of doing a 25-ish mile Twycross. I didn't actually plan it, was fairly confident I could get it to 25 or so by busking it. I took the Boardman. A bit cloudy and cool, but no rain. Not nearly as windy as of late, either. Set off at about 4:15pm. I wrapped up if anything a bit too warm, with long johns underneath my tights. I also trialled a new soft balaclava / hood hybrid item that I got off Amazon cheap - that was very effective, kept my ears warm and the wind noise out of my earplugs. But I took it off at the first wee stop as I was overheating slightly. Kept on keeping on after Sheepy, down to Ratcliffe. Hadn't been that far down on a Twycross for quite some time, not sure when the last time was. I suppose there must be some way to find out from Strava by scrutinising segments. Ah there is, just had a look. Unfortunately you can't sort them by date though but I've had a scan through and it looks like I last did that in May 2018. The dummy in the phone box at Ratcliffe is now wearing a Kaftan. Right knee especially was hurting a bit over the last few miles. I think I've overdone it slightly by doing 58 in the last three days. But I won't be able to do a significant distance until Friday at the earliest anyway due to other commitments, so I've got a bit of recovery time before my old legs have to undergo substantial pedalling duties again. So nice to do that two mile stretch between Ratcliffe and Sibson again. Getting dark by the time I got home. I had a decent head lamp with me but didn't need it, the road was still just about visible by the time I got back. I must sort out the new chain and cassette on the Boardman soon, some of the gear options are a bit juddery now. I remembered with only a few miles to go that I hadn't actually lubed the chain after hosing it out with GT85 last time - but I reckon GT85 is a decent lube anyway if you apply it often enough. Anyway that's another 27.36, and 182 this month. Wanted to get out on the bike today rather than tmorrow so I can have a (knee) rest day, and do 25 miles or so on Saturday. I've been keeping the Cannondale in reserve for a long ride, wanting to preserve the present allocation of tyre rubber and keep the gears in their present, smoothy-operating state as long as possible. But I don't know when I'll next be able to do another 80 miler, possibly not this year. So since the roads were nice and dry and I haven't been out on it for months, it got a run out. I love that bike. So quick, light and easy. Not as smooth and refined as the S-Works but it cuts through the distance in front of you like a sharp knife. I was half-expecting an email requiring me to intervene on some time critical work, so I had the idea of doing three laps of a simple 5 mile route close to home. But after the first lap I got bored and headed through Heather and Swepstone instead. I checked my email at Heather, then again at Swepstone where I did receive the unwanted email and had to pedal back the way I'd come. Fortunately that took me to just over 15 miles, which is my arbitrary distance to get me out of rowing machine duties. Anyway - that's 198 this month, 8 short of target. 561 this year. The weekend should be a bit cooler, but brighter. And the days are stretching out nicely now. Just for interest (mine, probably not yours) I weighed my bikes this morning, with a luggage scale. So the S-Works might be my poshest bike, but it's not the lightest. Just worked out that if I'd gone out on my hybrid just after Christmas when I personally weighed 81kg, with (at a guess) about 1.5kg of winter clothing / gloves / overshoes on, I'd be pushing roughly 11.5kg more up those hills compared to a run out on the Cannondale in summer clothing at my present personal weight of 74.5kg. Didn't weigh the Boardman 'special edition' but it has a carbon fork so presumably might be a bit lighter than the other Boardman. Or not .. the Cannondale is all alloy, not a fibre of carbon anywhere. Last night I plotted a route that would take me through Measham, west of Ashby to a village called Linton, then back from there a different way - a 24 mile rectagonal-ish route. I took the Planet X. I'm pleased to report that the apparent problem with the new left pedal turned out to be a problem with the left cleat on my Muddy Fox shoes - a large chunk of it had snapped or worn off. Will re-cleat it later, I wore my Shimanos today. A bit cold and blowy and once again I hadn't wrapped up warm enough. But I was delighted to find that I experienced only minimal knee discomfort throughout. My physio has given me some slightly more brutal versions of my exercises to do and I did some of them half an hour before starting. I think that may have made a significant difference. So anyway - out through Heather, Swepstone, straight on to Measham and along Burton Road. It's quite rare for me to come out this way, possibly because it's a bit more hilly than my usual routes. I took it very easy in order to preserve my knees. I took a wrong turn after about 9 miles, which took me off through Netherseal. But I didn't mind as this would have added only about half a mile onto my ride, and it was easy to get back on to the route proper a mile later. Unfortunately just as I'd rejoined the route I took another wrong turn, though I didn't realise this until I checked Google Maps to find that I'd cut right across to the "other side" of my route, in a considerable short cut. So from that point I made up my own route home, hoping to add a few miles back on - to Moira, through Willesley Woods which was rather pleasant, to Ashby, through the town centre there and back home along Ashby Road. The sun came out for the last 7 or 8 miles, and I warmed up a bit. Nice change. 21.63 miles, a couple short of my intended target but good enough. And that takes me to 219 miles in March, which is over target and more than I've done in a calendar month since May. I used the GPS Logger app to track my ride - it worked very nicely. For some reason my cycle trips west of Ashby can coincide with someone famous shuffling off this mortal coil. I suppose Tusk or Juncker are too much to hope for? Glad I got a ride in yesterday, as I didn't get to do what I planned today.